Trammell Crow Residential and the Halter Companies have teamed up to transform One River Park, a former 1970s-era office park, into a beautiful resort-like community that resides between two national recreation areas and overlooks the Chattahoochee River. Its waterfront homes boast an unparalleled variety of living styles, including 10 single-family cottages, as well as townhomes and mid-rise condominium buildings that offer a total of 39 unique unit layouts. The River House and the Sanctuary are the two One River Place residences that contain condominium living. The River House is rendered unique by a striking water foundation and private library, while the Sanctuary is distinctive because of its location at the edge of the river. It is the most secluded of the residences, and features a timber bridge over the Game Creek at its entry. 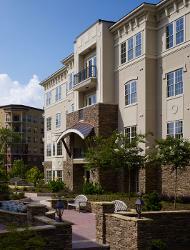 Townhomes are an integral part of One River Place’s living options. The Brownstone Townhomes are similar to those found in Boston or Philadelphia, and feature roof-top terraces with views. The Club Townhomes are located in the center of the community, featuring unique two-story bay windows. Garden Townhomes are the most luxurious of the residences, with porches overlooking their own park, private elevators, two- and three-car garages, and Juliet balconies. One River Place’s trickling waterfalls, gardens and views of the nature preserve unite its homes with their natural surroundings. In order to maintain the perception of a secluded home in the middle of nature, Trammell Crow and the Halter Companies utilized Keene Building Products’ QQ Step Soft™ 2 mm product, a sound isolation mat that is utilized in floor assemblies to reduce impact noise – a very important factor when trying to create a secluded nature community. The softness of the QQ Step Soft™ product creates a spring in the floor assembly and is designed for maximum noise absorption. Meanwhile, the product is firm enough to provide a solid surface for the hardwood above. Since One River Place chose to utilize hardwood floors in its home furnishings, noise control was especially necessary in multi-family residences to prevent footfall from disturbing residents in condos or townhomes below. For nature enthusiasts who are interested in reducing their carbon footprints, QQ Step Soft™ is made from 90% recycled materials. This reduces its unit cost, providing an effective and affordable means of controlling impact noise with a more environmentally friendly approach. 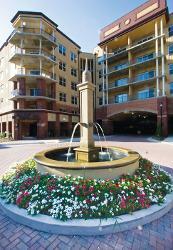 One River Place prides itself on providing the ultimate atmosphere for peaceful living. While QQ Step Soft™ is successful at exceeding building codes for noise isolation, it more importantly supports the community’s intended effect – that is, the union of living and natural harmony.